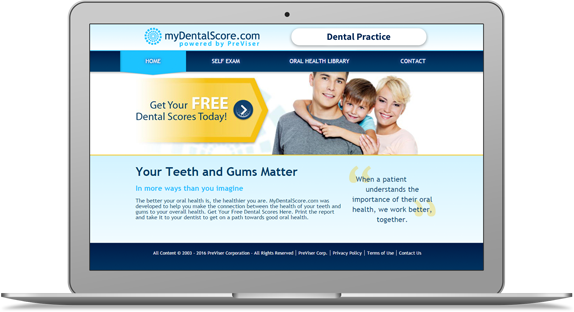 myDentalScore is PreViser’s interactive tool for visitors to YOUR dental website. Through a simple health questionnaire, myDentalScore generates scores for gum disease risk and severity, oral cancer risk, and restorative risk and needs, encouraging your patients to come and discuss their health status with you. your focus is their health. information in the oral health library on oral systemic links. myDentalScore looks great on iPads in your reception area. Why not get patients thinking / talking about their risks and needs before they come to see you. Do you send out appointment reminders? Include a link to myDentalScore on your website and get patients to self assess before their appointment. This also provides them with a reason to visit your website. myDentalScore costs just £50 to set up and tailor with your practice details plus an annual subscription of £75 (ie £125 in the first year then £75 thereafter). Subscribers to our PreViser and DEPPA clinical software are provided with myDentalScore free of charge. Click on the link below to set up your subscription. Paypal will take you to a secure form to complete with data to personalise myDentalScore for your practice. Submit this form, and within 48 hours, we will send you the link for your website. Please note, you will need access to your website to be able to paste the code for the link.